I have written a short bit about each handwriting set below. If you are looking for the manuscript handwriting set that is coordinated with the book Teach Your Child to Read in 100 Easy Lessons, that large set is under 133 Manuscript Lessons and that set may also be used by beginners. Readiness is a set that allows children to practice drawing the basic shapes of letters and in the direction that they should be drawn. Printing Readiness 2 is a set of drawings that I made and then made parts of the drawings traceable. With this set, the child traces over the dashed lines, or the entire drawing if they wish. Coloring is optional. This set is meant to help develop eye hand coordination. 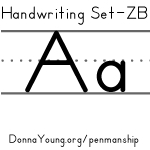 The handwriting printables offered in Large Letters have arrows and each letter is presented in both capital and lower case on the same printable. The letters and numbers are large and the page is printed horizontally. During 2002, I had a wild idea to place large and small words on the same worksheet. Each lesson in the Words set has a picture and words in large and small letters. The lessons in Targeted Teaching Manuscript teach writing in bits and then put it all together. Use as a follow-up to readiness or as a refresher for those children who have forgotten or those who have trouble. Shapes offers the 5 basic shapes that a kindergartener learns. A "Draw and Write" Blank is also provided. The alphabet in large hollow letters, sometimes called bubble letters, may be printed from this page. Each letter set, except M and W, uses one sheet of paper. The letter set consists of the upper and lower case letter. The letters are available in two styles shown below. Suitable for children who are learning the alphabet. Just more handwriting lessons. The Medium Letters set has medium sized letters and the pace is fast. The Recipes web page has a recipe for salt dough that requires baking, play dough, and finger paint. Playing with dough and finger painting might improve a child's motor skills. They show how to write a letter. I make these with drawing software and an animation program that allows me to put all the pictures together and set the timing. The entire alphabet is here in lower case. Some day I might add upper case when I can spare 26 hours. Don't miss the large manuscript handwriting set that is in "By Style." The set there have over 500 printable files and each file has two lessons. I made this set while I was cooped up in one room while our home was being repaired. The set also includes manuscript handwriting animations. This time I made capital letter animations as well as the usual animations for the lowercase letters. This very large set is made with letters that resemble the Zaner-Bloser style of penmanship. The homepage for the set is at: ZB Style - Printable Handwriting Worksheets and the homepage for the animations is at: Donna Young's Manuscript Handwriting Animations.